The ANSI Z136.3 (2018) - Electronic Version is a single-user PDF version of the standard that is nationally recognized as the definitive document on laser safety in health care environments, providing guidance for the safe use of lasers for diagnostic, cosmetic, preventative and therapeutic applications where bodily structure or function is altered or symptoms are relieved. This standard is applicable to any location where a health care laser system (HCLS) is used as a medical device, including hospital facilities, ambulatory surgery centers, individual medical, dental and veterinarian offices, and non-medical locations, such as salons and spas. It is intended for use by all personnel associated with the installation, operation, calibration, maintenance and service of the HCLS, as well as anyone who might be exposed to laser energy during a health care application procedure. Undeniably a must-have for all medical laser safety officers (MLSOs)! 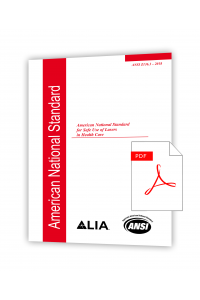 Order a hardcopy (print) version of this standard.